I still like buying physical games because I can sell them after I’m done. One of the easiest places to sell is at Gamestop. Gamestop has built a business out of buying used games for cheap and reselling them. Most people don’t like Gamestop trades because they think they are out to rip people off, but sometimes they have really good deals for the consumer. I made a big move from California to Washington state last year. There was no time to sell my games individually online. I had to focus on packing. Luckily there was a Gamestop trade bonus where is you traded in 5 or more games, that you would get a 50% bonus. I’m also a Pro member so I got another 10% bonus on top of that. I traded in a bunch of stuff and netted about $600+ in Gamestop Store Credit. Some of my previous trade where I took advantage of bonuses. I know selling individually on eBay, Facebook, or Craigslist would have netted me more, but selling to Gamestop definitely saved me a lot of time and money. The bonuses made it well worth it. Since then, my video game collection has thinned out a little bit since my last purge The other day, I did see a promo on the Gamestop website for a 60% bonus for 6+ games. A PowerUp Rewards Pro membership would add another 10 on top of that. I went through my collection last night to see what I could sell to net some store credit. The website was acting a little weird and very slow. It wasn’t letting me add trades to a list. 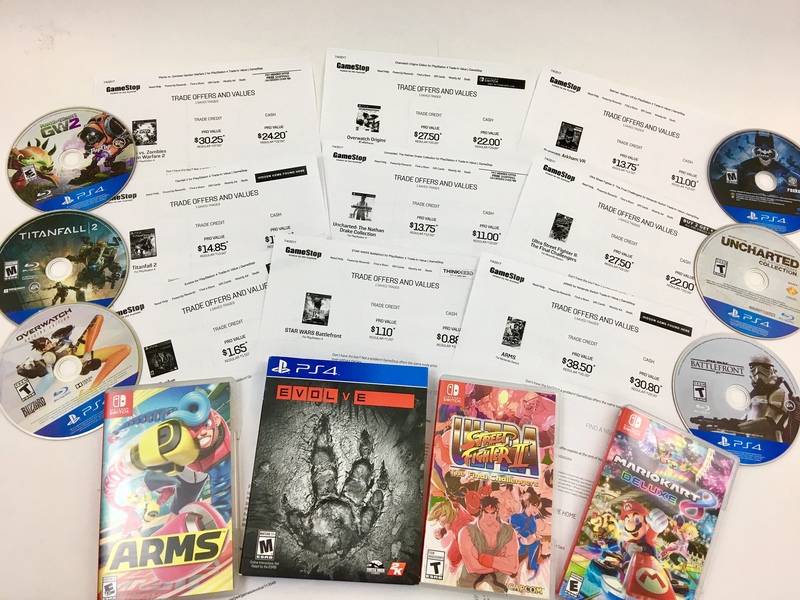 The prices quoted on the page showed that the Gamestop trade values were valid until the end of day July 4th. I have had issues in the past with trades where the stores computer didn’t align with the website. Also I’ve had the desktop website show different trade values than the mobile website. I decided to print out the pages. It was surprising to see Overwatch fetching a normal trade value of $25 and Plants vs Zombies: Garden Warfare 2 for $27.50. I love the games, but the Gamestop trade value would have been better. First Party Nintendo games always hold a high Gamestop trade value, so it wasn’t surprising to see $35 on Mario Kart 8 Deluxe and ARMS. I went into my local Gamestop and when they started ringing up on the computer, the trade values with both bonuses came out with different numbers than what my printouts showed. The guy at the register had to go ask his manager. His manager said that it looked funny as well and tried to get a hold of someone else via his cell phone. Since it was Independence Day, they didn’t pick up. I think he wanted to try and call corporate, but again, it’s a holiday. The superior associate tried to tell me that the numbers on the pages may have already reflected the trade bonus and that their computer was showing “higher” for some. I know for a fact that the base trade value on these printouts are used to calculate the bonuses. Even the pro bonus is printed on the trade value page itself! I didn’t appreciate him trying to pull one over on me. I’ve have been doing Gamestop trades for years. The screen showing everything with trade bonuses was way lower than it should have been. Both associates really wanted to help me, but at the same time, they didn’t want to risk their jobs. They weren’t sure what to do. In the end, I kept the games and decided to write about this Gamestop trade deal that didn’t happen. They told me that I should hear back from them by the 9th, but we’ll see if anything happens. Sometimes you win, sometimes you lose. UPDATE 7/12- I never heard from anyone.